signed and dated 1971 and on verso signed, titled and dated on the gallery label and inscribed "36"
The Florentine was painted during the years Mary Pratt lived at Salmonier, on the Avalon Peninsula in Newfoundland, with artist Christopher Pratt and their family. She juggled being an artist with being a wife and mother - and often turned her artistic attention to domestic imagery close at hand, such as the preparation and presentation of food. Pratt commented, "My strength is finding something where most people would find nothing." She found beauty in the glistening light bouncing off a fish fillet lying on tinfoil, in light reflecting through jam jars or a glass bowl containing fruit. Here squares of sunlight illuminate an exquisite tea setting of Florentine Turquoise Wedgwood bone china, strikingly contrasted with the dark table and even darker background. Although no one is present, the setting collected on a tray is evidence of the timeless ceremony of two people meeting over tea. The immediate impact of works such as The Florentine lies in their meticulous Realist style, but on a deeper level, comes from the human dynamic resonating from such everyday scenes, that ephemeral "something" that Pratt searched for. 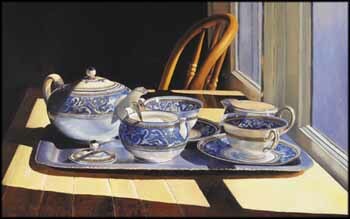 The National Gallery of Canada is currently holding an exhibition of Mary Pratt’s work entitled Mary Pratt: This Little Painting, Masterpiece in Focus, on now through January 4, 2016.